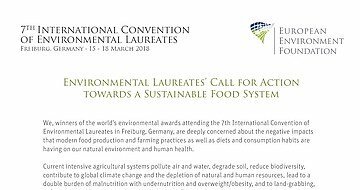 We, winners of the world’s environmental awards attending the 7th International Convention of Environmental Laureates in Freiburg, Germany, are deeply concerned about the negative impacts that modern food production and farming practices as well as diets and consumption habits are having on our natural environment and human health. Current intensive agricultural systems pollute air and water, degrade soil, reduce biodiversity, contribute to global climate change and the depletion of natural and human resources, lead to a double burden of malnutrition with undernutrition and overweight/obesity, and to land-grabbing, unfair wages and poverty, and exploiting animals/livestock. Damage to land caused by large-scale monoculture, heavy use of chemical fertilizers and pesticides, toxic and radioactive contamination, and waste and runoff from the production of food and especially animal products are accelerating the extinction rate of species and the degradation of ecosystems, imperilling the environmental foundation of our food systems. Overfishing, pollution and unsustainable aquaculture are damaging the marine and fresh water environment. The global food system along the entire production-to-consumption continuum must urgently be redesigned in such a way that it meets the needs of each and every person on the planet in a sustainable, equitable and just manner. - support local governments in creating communities that help consumers make healthy and sustainable food choices. - invest in and support local farmers in the sustainable production of food. - put pressure on industrial agriculture corporations. - advocate for a transformation among their peers and marketing organisations towards markets that reward sustainable production. We call on all stakeholders to contribute to achieving all Sustainable Development Goals, especially Goal 2 to “End hunger, achieve food security and improved nutrition, and promote sustainable agriculture”; Goal 4 to “Ensure healthy lives and promote wellbeing for all at all ages”, and Goal 12 “ Ensure sustainable consumption and production patterns”, as well as the environmentally-related Goals 13, 14 and 15.